I’m pretty excited to share this recipe with you all. Not only does it highlight some of my favorite vegetables, but the subtle Indian spices in the chana masala take this simple stuffed sweet potato to a whole new level. This meal is perfect for a chilly winter evening, and the aromas in your house will send your family members charging for the kitchen. Even our dog came bouncing in while the veggies were cooking. If you’ve been to an Indian restaurant before, you’ve probably heard of chana masala before, even if you might not have ordered it yourself–it’s also sometimes called chole masala. The main ingredient in chana masala is chickpeas. They’re simmered to perfection in a tomato-based sauce with Indian spices. Usually chana masala is served over rice or with a side of naan, however, adding this traditional spicy chickpea dish to a roasted sweet potato is hands down my favorite way to enjoy it. And if you have leftovers, they work hot or cold, so it’s perfect for bringing to lunch. We had one sweet potato and extra filling left over, and we enjoyed it the next morning with a fried egg on top. 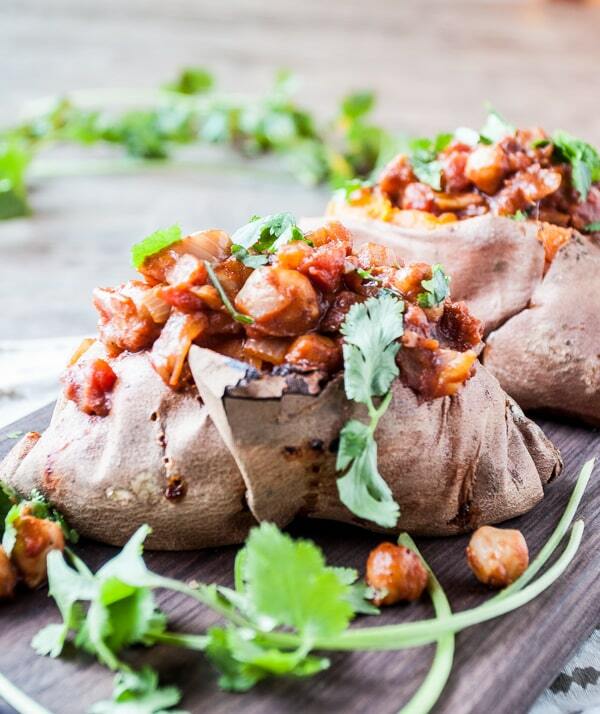 Homemade chana masala makes baked sweet potatoes into a filling meal. Prick the sweet potatoes several times with a fork and place on a baking sheet. Roast for about an hour, until tender. While the sweet potatoes cook, add the coconut oil to a large pan over medium-high heat. Stir in the onions and cook until they begin to soften, about 5 minutes. Add the garlic, ginger, garam masala, paprika, salt and pepper. Cook for about 1 more minute, stirring often. Add the tomato paste, canned tomatoes and chickpeas. Bring to a boil, then reduce heat and simmer for 25-30 minutes, stirring occasionally. Pour in the coconut milk and continue to simmer for 5 minutes more. Taste and adjust seasonings if needed. To serve, slice open the sweet potatoes and scoop a healthy portion of the chana masala into each. Garnish the potatoes with the minced cilantro. Loving this! The color is amazing, all that vitamin A! I’m a huge fan of graham masala. Thanks! Im allergenic to coconut milk but I really wat to cook with masala. Could I sub for cashew milk? Yes! Also, if you eat dairy even a little whole milk or dash of heavy cream would work well too! Let me know how this turns out for you. Bon appétit! This looked so good and so I tried it. I am not an inexperienced cook but have not been able to successfully use graham masala. My husband ate a little; it didn’t pass the ‘sniff’ test for my son (who is not thrilled to be eating vegan, in the first place), and I ate a large serving. I really don’t care for it, I must say. Looks great but I have a ton of it left to eat in the next few days unless I throw it out which I hate to do. I’m sorry this didn’t turn out for you. We’ve been eating a version of this chana masala recipe for years. It’s a staple in our household. It sounds like you’ve tried a few recipes with garam masala which may not be a spice you or your family loves. Sorry it was a waste for you. Lovely recipe! Looks amazing! I shall give this a try this! This . Sounds. so. AMAZING! I am such a sucker for anything masala. I’m sold. delicious flavor combination! I must try this sometime!! this sweet potato has my name written all over it. OMG! These look fantastic! Love sweet potatoes and Indian spices. Will be trying these soon. I hope to incorporate more of a vegan diet in my household and this will be a great start. Thanks for always sharing so many appealing recipes! 🙂 It inspires me to try. I love coming up with different fillings for sweet potatoes! My fave right now is Mexican, but this one you have created looks awesome. I’ll have to give it a try! I made chana masala just the other day! And now I’m wishing I had thought to top a sweet potato with it because GENIUS. Made this for lunch! Super yummy! I did half the amount of masala and paprika as I knew it would be too much for me. Made a lot! I’m looking forward to the leftovers. My recipe came out tasting thin. I noticed that the chana masala was not as thick as your picture. Did you drain the can of tomatoes? I did not drain my tomatoes. Every can of tomatoes will have a different liquid ratio. If yours was thin I’d let it cook longer on the stove to thicken up. Loved this – great flavor – thanks for the idea! First time cooking with Masala and loved it so much I added a little more:). I also noticed that it wasn’t as thick as the picture and wondered if you drained the tomatoes? thanks for you comment. I did not drain my tomatoes. I’ve noticed each can has a different liquid ratio in which case you may want to cook the chana masala longer to thicken up on the stove. I hope this was helpful! This looks INCREDIBLE. I’m a huuuuuuge sweet potato and garam masala lover — have actually experimented with them together before (with winning results!). I’m not big on chick peas, though — wondering if you think this would work with lentils? I know it wouldn’t technically be chana masala, but I was thinking the flavors and textures would still go well together…? Thanks in advance for your input!